Judge Raymond Voet. Smartphone not pictured. A JUDGE HAS found himself in contempt of court after his phone went off during a hearing. 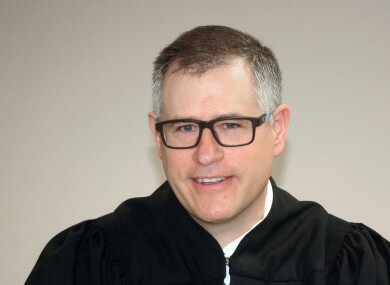 Judge Raymond Voet fined himself $25 after the incident at his Michigan courtroom. He said he was confused by a new model of smartphone which “started talking really loud”. Voet has a posted policy at Ionia County 64A District Court stating that electronic devices causing a disturbance during court sessions will result in the owner being cited with contempt, the Sentinel-Standard of Ionia and MLive.com reported. I’m guessing I bumped it. It started talking really loud, saying ‘I can’t understand you. Say something like Mom. “That’s an excuse, but I don’t take those excuses from anyone else. I set the bar high, because cellphones are a distraction and there is very serious business going on,” he said. Email “Judge slaps himself with fine after phone goes off in court”. Feedback on “Judge slaps himself with fine after phone goes off in court”.